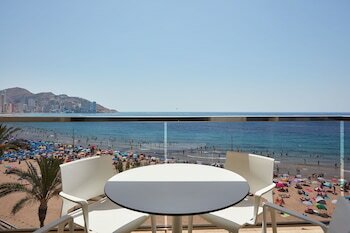 When you a stay at Apartamentos Don César in Benidorm, you'll be on the beach, just steps from Levante Beach and Placa del Castell. Featured amenities include express check-out, multilingual staff, and luggage storage. Self parking (subject to charges) is available onsite. With a stay at this villa in Antequera, you'll be 5.1 mi (8.2 km) from Torcal de Antequera and 7 mi (11.2 km) from El Torcal National Park. Free self parking is available onsite. With a stay at Hostal Saturno in Sant Llorenc des Cardassar, you'll be by the sea, just steps from Cala Millor Beach and a 5-minute drive from Punta de N'Amer. When you stay at Complejo Rural el Mesón in El Real de San Vicente, you'll be 9 minutes by car from Rollo de Justicia. Free self parking is available onsite.